Have you ever heard of the cable channel "Charge"? It's not everywhere yet, but it shows action programming - movies, shows, sports, whatever. Saturday evenings at 10 they show a couple martial arts movies in a row ("Chopsocky Saturdays"), which is how, a few weeks ago, I was finally able to see the original Drunken Master. Good timing! 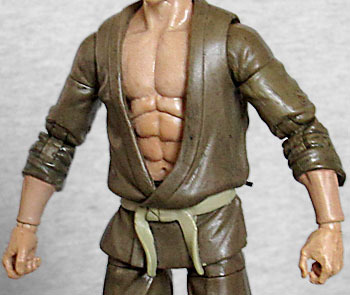 Seijun the drunken master uses the same torso as Itami the evil sensei, with the loose-fitting shirt and the rock-hard chest underneath. Really, if the guy is living in an alcohol-fueled haze, shouldn't he have a beer gut? Since the upper and lower torso are separate pieces, all it would have taken would have been molding a new stomach, without the harsh definition. He has the legs from the ninjas and the feet of the samurai, which is an odd choice: again, he's a drunk, so wouldn't Itami's pantlegs and bare feet have made sense for him? Who's helping him wrap his shins up every morning? I figured the loose shirt was because he didn't care enough to do it up properly, but he's got time to tuck his pants into his socks? It's easier to appreciate the sculptural details on this figure than on Itami, since his clothes are tan, with his belt and socks being an even lighter shade. When you think "drunken master," you think of Jackie Chan. Or at least, you should. If you think of that guy from the first season of Iron Fist, there's something wrong with you. Anyway, the face on this toy seems to be strongly influenced by Chan. The structure of it is more narrow, lacking Chan's distinctive roundness, but the size of the nose, the shape of the mouth, the eyebrows... personally, we might have gone for a more expressive expression (happy/silly drunk), but then the likeness might not have come through so strongly. Okay, so here's a weird little factoid for you: Jackie Chan's character in the two Drunken Master movies was the same guy Jet Li played in Once Upon a Time in China. Now, that's a bit of a cheat to claim, because they're both playing Wong Fei-Hung, who was a real person. He's a folk hero, with lots of legends built up around him, so they're playing fictionalized versions of him - claiming they're the same is like saying the Mark Twain from Star Trek and the Mark Twain from the Three Stooges' Rockin' in the Rockies are the same character: the same historical basis, but not meant to be one guy with one timeline. 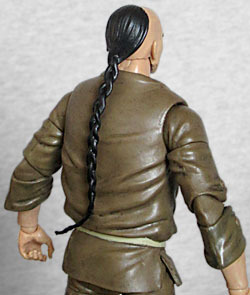 Articulated Icons' Seijun definitely takes some cues from the Jet Li version, with his hair done in a queue style - bald in front, and a long braid in back. Cleverly, this is done as a separate piece that plugs into the same hole the samurai's top-knot (and helmet) fit into. Drunken boxing is a real style of martial arts, with two different origin stories: in one, a man fled to a Buddhist temple after killing someone, becoming a monk in exchange for sanctuary; however, he couldn't give up alcohol, drinking whenever he was able; eventually the other monks threw him out, but in his stupor he still managed to fight them off; once he sobered up, he thought back upon his actions and adapted his actions into the standard forms. Meanwhile, taoists ascribe the style's creation to the Eight Immortals, who got drunk at a party. The Articulated Icons articulation means you can get Seijun into plety of suitable poses: he moves with swivel/hinge ankles, swivel shins, double-hinged knees, swivel thighs, balljointed hips, swivel waist, a swivel/hinge torso, balljointed hands, swivel/hinged wrists, double-hinged elbows, swivel biceps, swivel/hinged shoulders, a hinged neck and a balljointed head. 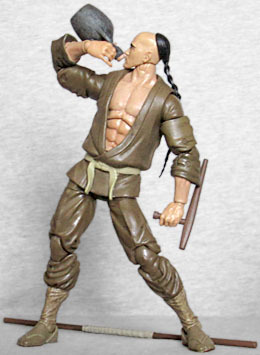 The figure has three sets of hands: two fists, two to hold accessories, and two in that Bruce Lee "pinkies out" pose. Considering the character's inspirations, it might have been preferable to make hands with the index fingers out (the way Jackie Chan held his hands in the movie), but then we'd probably be writing this review and dumbly asking why he had his trigger fingers extended. His accessories include a bo staff (one of the weapons Wong Fei-Hung mastered), a pair of tonfas, and a jug of wine. Unfortunately, the jug looks more like an ancient Grecian style, rather than Japanese. There are two Seijun figures in the first series of Articulated Icons: this one, when he was still a drunkard, and another when he gets his life back together. And if you read between the lines of the biographies printed on the boxes, it seems they also made the man he's hunting for. 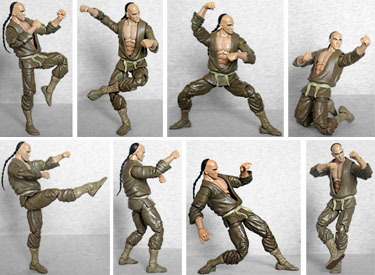 There are a few things we might have changed about the drunken master, but they're all minor and none of them keep this from being a good toy.